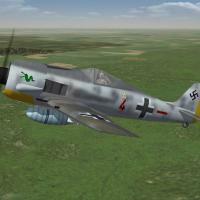 Mods, rebuilds, reskining/redecaling for Wolf's FW-190. This is the second of a series of FW-190 upgrades, that will cover those models (while still based off Wolf's original LOD), that were/are available from the 1stGen SF/Wo* mods previously released. With required upgrades for SF2. This mod is designed to REPLACE any 1stGen variant you may have in your WW2 ETO intalls. It is reccomended you delete the aircraft and decals folders of the originals, as to NOT cause any conflicts with THIS mod. Skins are in jpg format, and decal randomization is set to TRUE. A (semi) compliant SF2 FM was cobbled together from various sources. As always, while it works quite well, further fine tuning is required by Experten. Sounds, pilot figures and weapons are included, as well a new SF2 version of my "box art" Hangar and/or Loading screens. Please note, the engine sound in this one has been changed to the AVHistory BMW 801 sound. 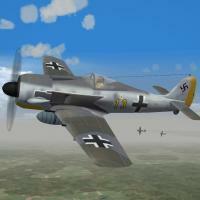 It's reccomeneded you make this change to the FW-190A-1 that was recently released. It's a VERY simple text edit. As always, fairly easy to follow, yet detailed install instructions are included. PLEASE read them!!! Also, the "Notes" section for other important stuff of interest. When discoverable, Wolf's original readme is included for historical purposes.